Only legitimate users may have access to the site. Subscribers must ensure that they keep confidential, any username and password provided to them to ensure the integrity of their data on the site and prevent unauthorised access. Documentation provided on the site may only be used by companies registered with the human resources platform. The information and documentation provided for on the site remains the strict property of the human resources platform and is protected by Copyright. Any unlawful copying or distribution of the documentation will render the user liable for restoration and damages. Access to the site is provided only on successful registration of the user on the system. Successful registration requires a user to complete and submit a registration form, and a debit order form, and to pay a set-up fee. the human resources platform provides a facility to users to store and record information relative to their employees in a "cyberspace" capacity. This does not replace an employers' legislative requirement to record and retain documents on site for inspection by government officials. Whilst every endeavour is made to ensure a consistent standard of quality with regards the information provided on the site by employers, the human resources platform,My Labour Space (Pty) Ltd, or any of its employees or agents, cannot be held responsible for any information supplied by a user, that may or may not enter the public domain, or that may be inaccurate. The success of the site and the information provided therein is entirely dependent on the accuracy of the user in entering such information. 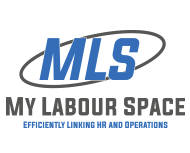 the human resources platform My Labour Space (Pty) Ltd, or any of its employees or agents, cannot be held liable for any errors incurred by the user whilst using the site. Whilst every attempt is made by the service providers to keep secure and maintain the integrity of the data on the site, each user is also responsible to conduct regular backups, a facility that is provided on the site. The user indemnifies the human resources platform and its owners/ employees or agents, against any claim what so ever relating to the information provided on the site, the use thereof, and the accuracy or retention thereof. The user agrees to the costing structure, and confirm their understanding thereof, as provided for the use of the site and confirm that he or she has the necessary authority to transact on behalf of the employer which they duly represent. Additional employees above 100 registered on the system, will cost an additional R2 each per month per employee above 100, in groups of 20. There is a once-off setup fee of R450 for “General Employers” or R1950 for “Industry Specific” users, who benefit from Industry specific Documents being available to them on the site. to set up your account as well as a R150 cost per 500 sms “bundle”. This excludes your first month's subscription which must be paid in advance as well. Payment is in advance paid by debit order and must run for a minimum of 12 months, thereafter 1 months' notice will apply..